At California Home Goods, we know how important it is to have a beautiful space that brings meaning to your life. That’s why we designed the 4 Piece Hanging Planter Set to add some natural greenery to liven up any room. Built with high-grade, polished ceramic, each petite and lightweight pot can store your favorite succulent, flower, or herbs. Each set comes with all the hardware needed to mount your plants to the ceiling or wall in minutes. ATTRACTIVE CERAMIC DESIGN: Beautiful modern design adds an elegant touch to any room while bringing some natural greenery to your indoor sanctuary. The 4 piece design the space to hang a range of plants, from succulents to flowers and herbs. UNIQUE HANGING WALL & CEILING DECOR: These small, petite planters add a delicate touch to your kitchen, patio, deck, or any other indoor / outdoor space. The white serves as a nice contrast to any flower, succulent, or plant -- it's sure to be a regular conversation starter! COMES WITH WHITE OR BROWN ROPE: Each set comes with two sets of ropes. The white rope comes pre-assembled with every planter set, however if you'd prefer a natural brown colored rope, we've provided that for you as well to give you more options. 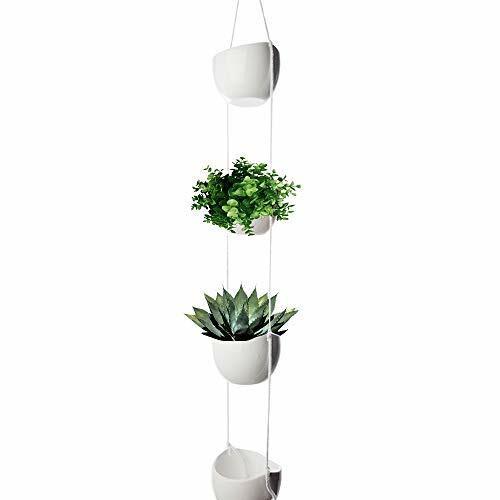 LIGHTWEIGHT & EASY TO HANG / INSTALL: The flowerpot planters come complete with all the necessary screws and hardware needed to mount the ceramic bowls to virtually any wall or ceiling in just minutes. Brighten up any room with your very own indoor garden!